FBI deputy director Andrew McCabe is set to receive a nearly $2 million pension, according to a Washington Free Beacon analysis. The top law enforcement official, who has come under scrutiny for overseeing the investigation into Hillary Clinton's private email server, stepped aside on Monday. McCabe took early retirement, which he was eligible for after serving at the bureau for over 20 years. McCabe joined the FBI in 1996 and worked his way up to high paying executive service positions. He was serving as the assistant director in charge of the Washington, D.C., field office until July 2015, when he was named the FBI's associate deputy director, carrying an ES Level 4 pay scale. The Federal Employees Retirement System (FERS) calls for law enforcement officers to receive 1.7 percent of the officer's average highest salary over a period of three consecutive years per year for the agent's first 20 years of service. Additionally, they receive 1 percent of the highest average salary for each year exceeding 20 years of service. McCabe served 21 years. At executive and senior pay levels, McCabe's average highest salary is estimated at $157,800, taken from his various roles at the FBI between 2015 and 2017. The estimate is based on executive service pay levels compiled by FederalPay, a public resource that uses data from the General Services Administration and the Office of Personnel Management. In 2015, McCabe received roughly $151,200, after reaching the higher ES Level 4 salary in July after being named associate deputy director. McCabe received $160,300 in 2016, after James Comey appointed him deputy director. In 2017, remaining in an ES Level 4 position, he received $161,900. 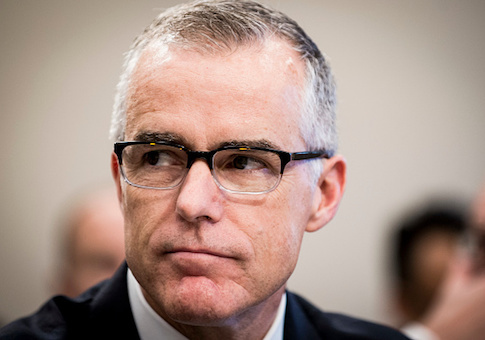 By multiplying McCabe's highest average salary of $157,800 by 1.7 percent, for each of his first 20 years of service, he receives an annual $53,652 pension. He receives an additional 1 percent for one year of service, having served since 1996. This gives McCabe an additional $1,578, giving him an annual pension of $55,230. The Office of Personnel Management has set the average life span of law enforcement officers at nearly 83 years. The lifetime value of McCabe's pension is estimated at $1.8 million. McCabe is 49, though he likely had enough paid vacation days saved up to step down before his 50th birthday, the age requirement for those taking early retirement with at least 20 years of service. As a law enforcement officer, McCabe is also eligible for cost of living adjustment on top of his pension. McCabe has been at the center of controversy over leadership at the FBI since before the 2016 presidential election, when the Wall Street Journal revealed his wife received over $600,000 for her failed Virginia state senate campaign from political groups tied to Terry McAuliffe, a long-standing ally of Hillary Clinton. McCabe oversaw the investigation into Clinton's misuse of classified information. McCabe received the statement drafted by Comey exonerating Clinton months before she was ever interviewed for the investigation. He was also referenced in text messages between Peter Strzok and Lisa Page, the anti-Trump FBI officials who discussed an "insurance policy" if Trump won the presidential election. This entry was posted in Issues and tagged FBI. Bookmark the permalink.